You know how there are things you just love and you can live with forever. Then there are things that you loved at the time you did them, and even for years after, but then the time comes when you just need to change things up. 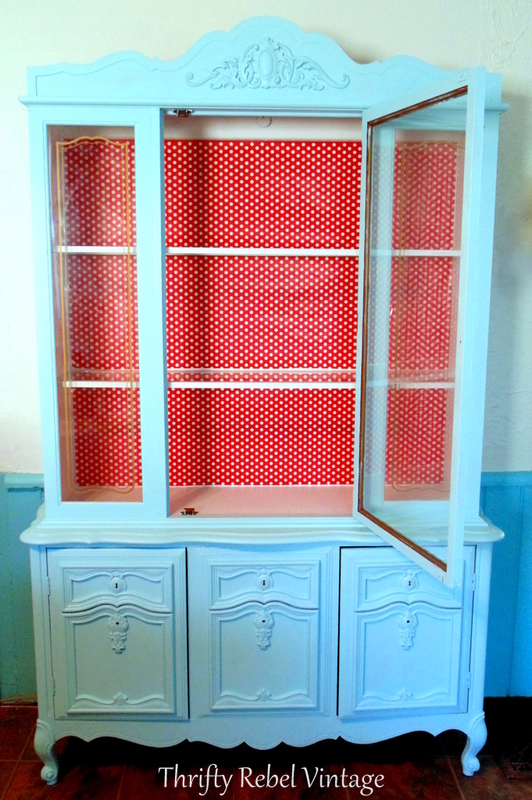 Well, this kitchen china cabinet makeover is the latter. For a while there I was starting to think it wasn’t going to happen. My decoupaged kitchen counter took much longer than I thought it would so it kinda slowed down my progress on other projects. 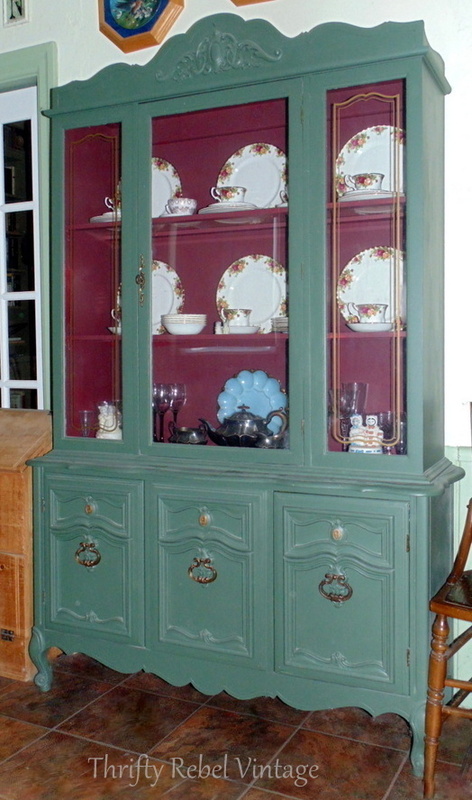 Here’s a before picture of the china cabinet in my Kitchen Makeover Adventure Begins post. I packed the Royal Albert Old Country Roses china away in their original boxes and got to work. 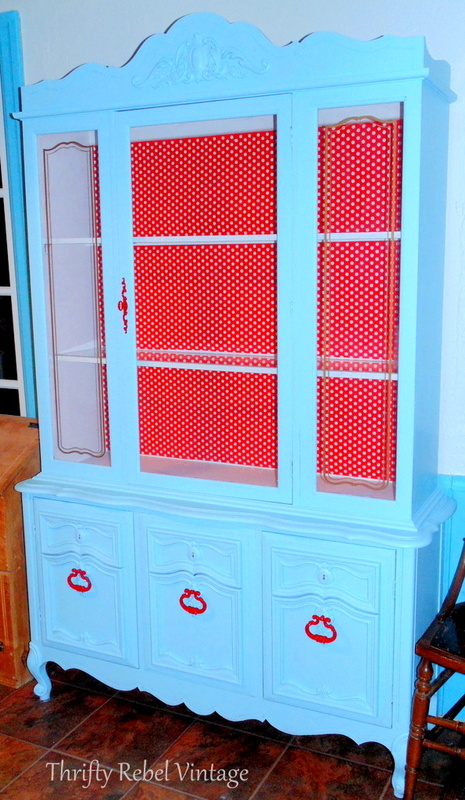 To fit in with my aqua and red kitchen makeover this cabinet needed a complete overhaul. Each shelf has 3 glass inserts. The first thing I wanted to do was get rid of that burgundy. I painted the inside with two coats of the same high hide white paint and primer combo that I used on my kitchen walls and on the faux tile backsplash. This china cabinet is a bit of a pain because the side windows aren’t doors, so I had to use a little craft paint brush to paint the fronts of the shelves. Because of the hard angle this took three coats. 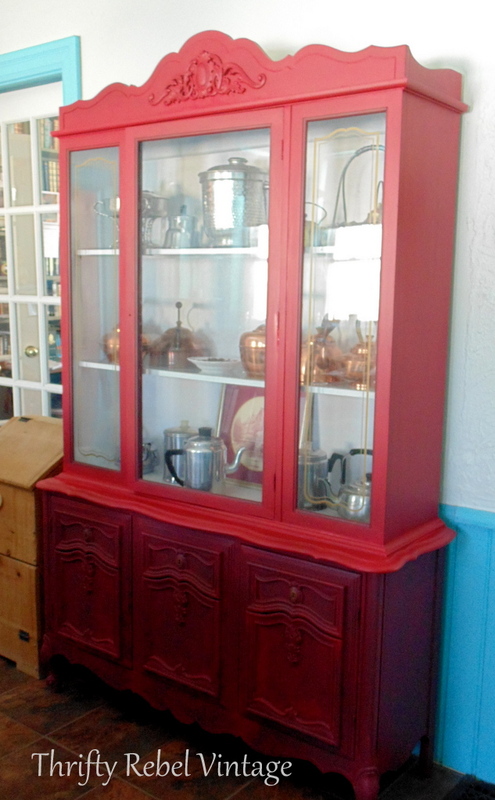 I thought I wanted the outside of the china cabinet to be red so I bought a little sample can of Hot Tamale Red because I knew I wouldn’t need much paint. The lady in the paint section said I would be all right foregoing the tinted grey primer usually required because of the green shade that I was covering. After applying one coat to the bottom section and four to the top I didn’t like it at all. Actually I hated it, and you know I really dislike something when I use the “h” word… because I rarely do. When I painted my living room walls red years ago I vowed that I would never paint anything red again, but it seems I had forgotten that. I think the only reason they stayed red for so long was because of all the trouble I went through to paint them. They are now a pretty blue, but I digress. lol. Back to this makeover. Check out the colour difference between the four-coated top and the one-coated bottom. Why is it that I seem to prefer the reds that need tinted primers and umpteen coats? I just like their tone I guess. No matter. Just like I changed my mind about the kitchen cupboard colour, literally while on my way to the paint store having already chosen a colour, I changed my mind here too. In my world it is never ever too late to change my mind. I would rather start again and be happy than continue down a road that just isn’t doing it for me. It’s very easy to mix your own paint. So I grabbed my Enchanted Evening kitchen cabinet aqua and mixed it with some of the white. I did about a half to half ratio. Now I had a completely new vision and I instantly knew what had to go on the inside. All I had to do now was find it by the weekend. I didn’t find my first choice when I was out last Friday, but I did find a few fun things that I could use in a pinch at a dollar store. 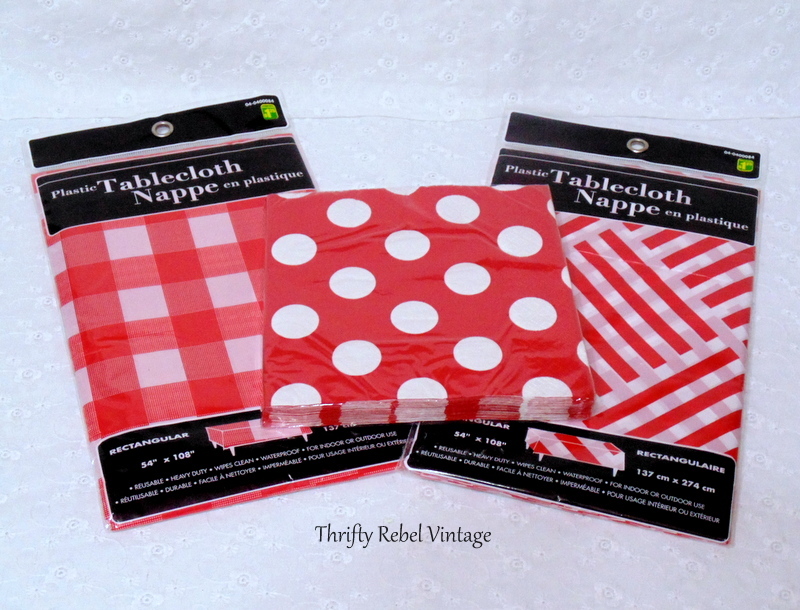 Two plastics table cloths, one in a red and white check and the other in a herringbone-like pattern, and some large polka dot napkins. I was bound and determined to get my china cabinet done this past weekend no matter which one of these I was going to use. Any of the three would have looked good I think. 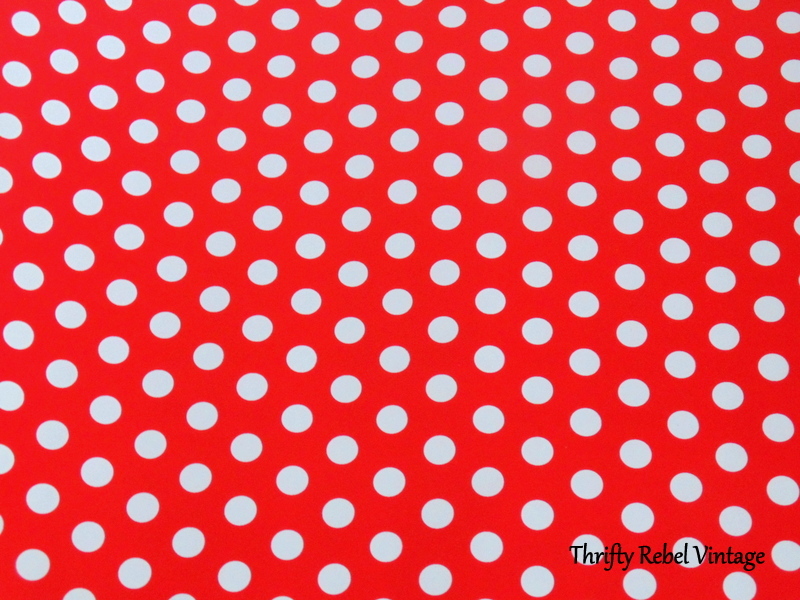 But thankfully when John and I went out for our usual brunch on Saturday, and a little thrifting and shopping too, I found this fabulous $1 roll of polka dot gift wrap at a different dollar store. Woohoo! It was exactly what I had envisioned in my mind. It was perfect! So, all I needed to get this makeover done was a ruler, a pencil, a measuring tape, scissors, and some double sided carpet tape. I measured the inside areas of my cabinet, marked my measurements on the wrapping paper, and cut out the pieces. 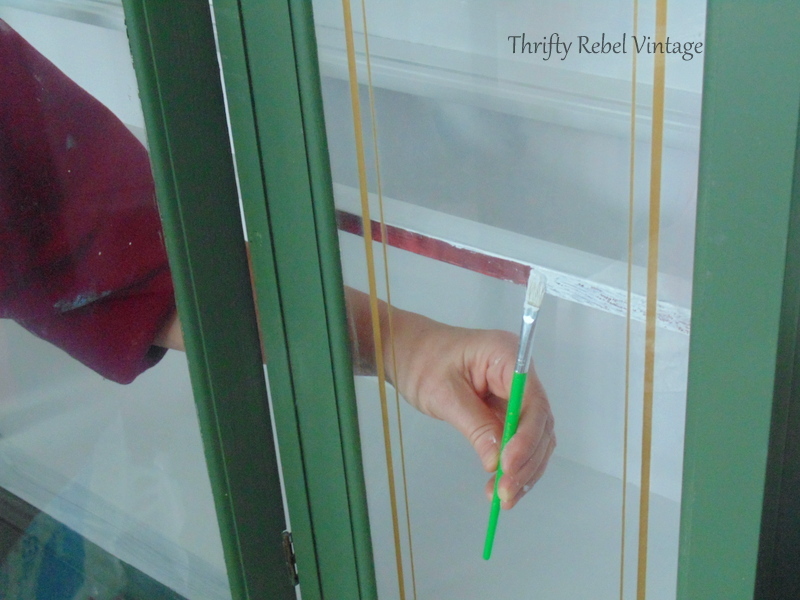 Then I placed the gift wrap pieces on the back of the china cabinet using just a few small pieces of the double sided carpet tape. I used one in each corner and one in the middle of the top and the bottom. This went much easier than I expected. The gift wrap is so thin that I was worried about it tearing, but it was all good. Not making the paper permanent means I can easily change it in the future if I ever change my mind. I really love this colour combo so I don’t think I’ll be changing it any time soon. For the finishing touch I spray painted the hardware a bright apple red. The red really pops on that pretty light aqua. The tone of the aqua looks slightly different at different times of the day depending on the light. To me that just makes it more interesting. 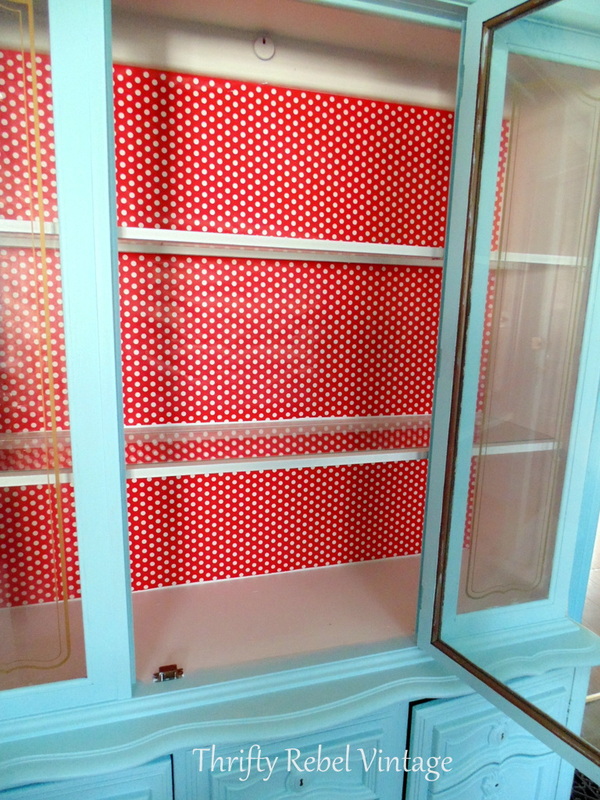 I’m so happy with how my kitchen china cabinet makeover turned out. 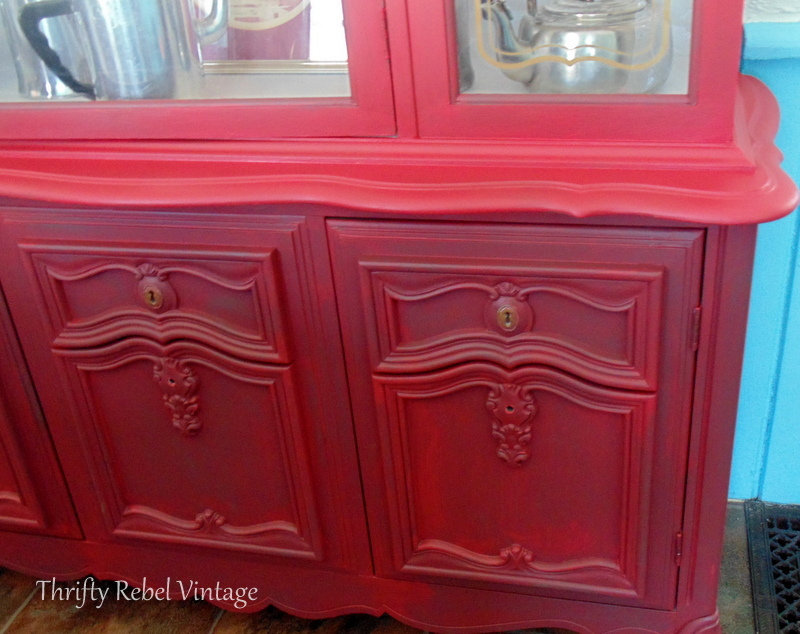 I figure this kitchen china cabinet makeover cost $3 for the portion of the red sample paint that I used. If I skipped over that red mistake it would have only cost me 50 cents for half the roll of wrapping paper. I had the red spray paint, which I didn’t use much of anyway, and the double sided tape already. I’m thrilled that I started over when my first makeover attempt was going in the wrong direction. Never be afraid to change your mind mid-project if it doesn’t feel right. It’s so much better to do that than to continue on with something you’re not loving. Trust your gut instincts and your projects will most likely turn out better than you even imagined. Your creative juices are flowing! Another fabulous makeover! I love the light aqua and the pop of red just makes it. Your kitchen is just plain FUN! Thanks so much AnnMarie! 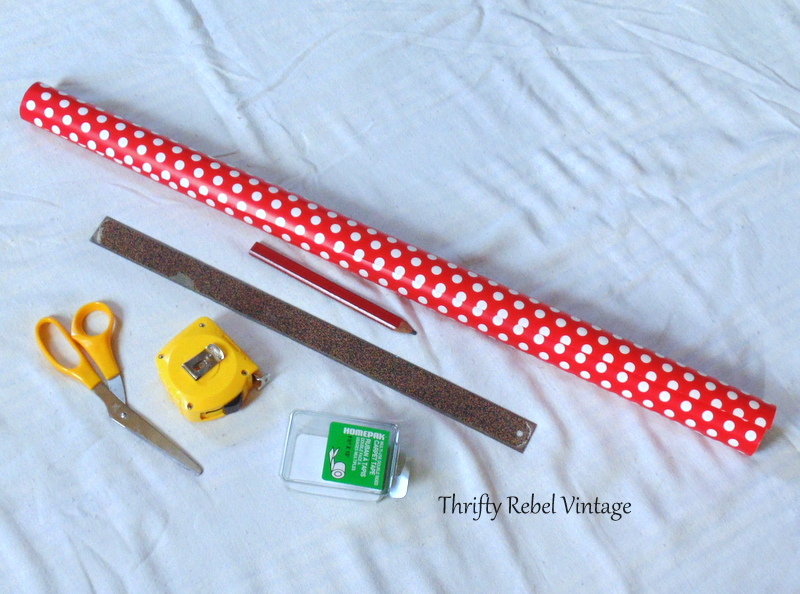 I was so lucky to find that polka dot wrapping paper. It makes me smile. OH MY GOODNESS!! How can everyone NOT smile when they walk in to your home and see this beauty! 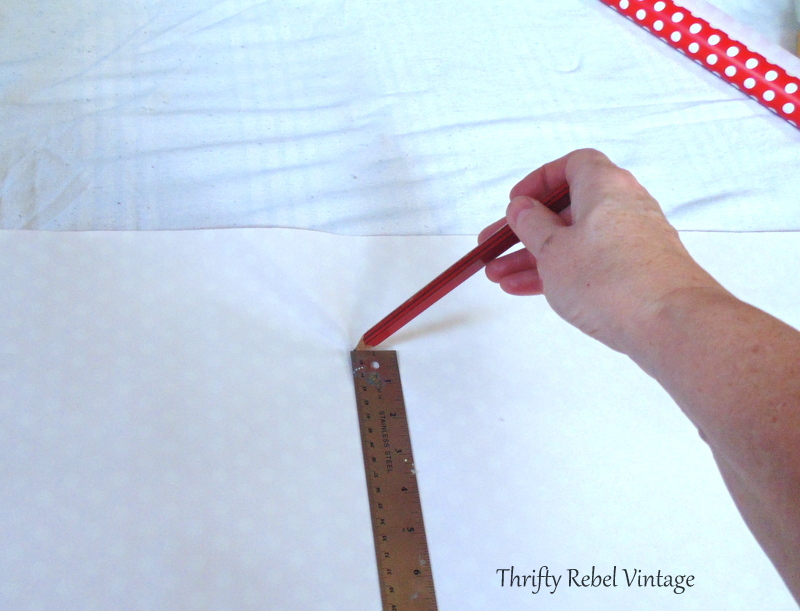 Two of my most favorite colors combined into one project – adorable! Definitely looks like a lot of work but definitely worth the effort! Thanks Lauren! The four coats of red certainly were a lot of work, but I’m so glad I changed my mind and went with the lighter aqua. It really is never too late to change our minds. I would love to see it all in person Tuula! The mix of colors is amazing! Thank you so much Florence! The colours and patterns are really making for a happy room. 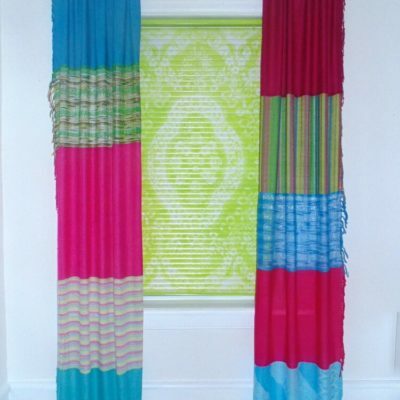 I’m looking forward to spreading colourful happiness into other parts of the house too. After the kitchen is done, of course. OMG; that is Stunning. Such a Beautiful make-over. I think a complete set of all white dinnerware would be just lovely in there. Thanks so much Colleen! I agree with you white dinnerware would look great in front of that polka dot background. It would have to be vintage, or at least thrifted. Thanks very much Dona! I’m looking forward to the hunt for my new china. I’m hoping to luck out when garage sale season starts in the spring. Genius and beautiful Tuula. Love the aqua and the red together. Really makes this piece. Beautiful re love. Thanks very much Kris! I’m really loving the polka dots. Happy hunting for your china! I’m sure you will come up with something totally original! I actually don’t think it will be too hard, because I like the same colors and have quite a few things in those colors! I have learned a lot from following your kitchen project. Love the end result! Red/aqua is my favorite combo. in such a pretty cabinet. Good job! Thanks Mary! Love that you have an aqua ceiling in your red and white kitchen. 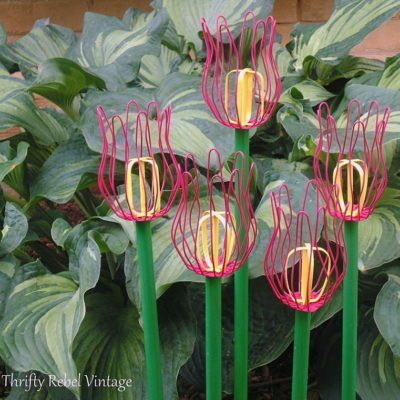 I have no doubt that it looks fabulous! I love coloured ceilings and have a hot pink ceiling in my craft studio. My kitchen ceiling is the first white one that I’ve had in years, and it seems to work with how colourful the rest of the kitchen is… and it reflects light beautifully. Thank you for sharing your process. It is beautiful! Thanks Kathleen! It’s always fun to have something specific to hunt for, especially with garage sale season coming in the spring. this really did turn out wonderful and fun! 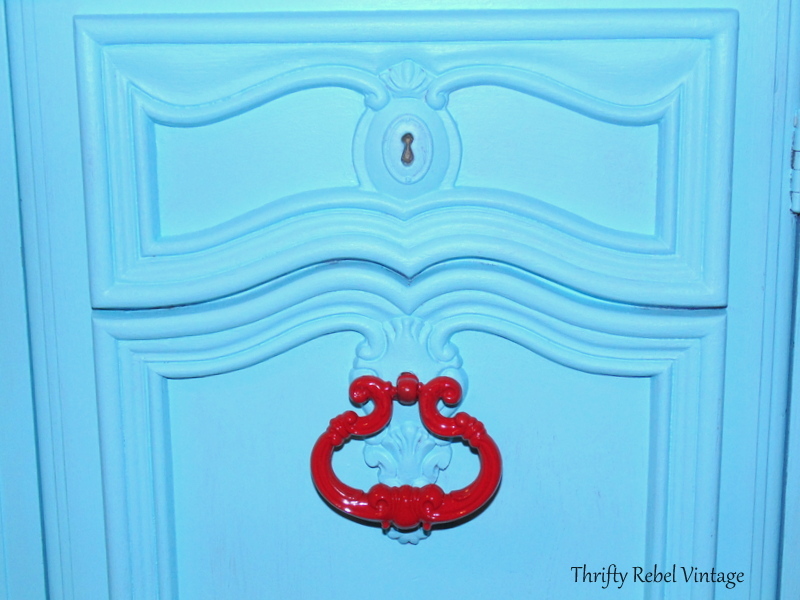 One thing is bothering me…having just the knob hardware painted red on the china cabinet seems out of balance. Would you consider painting the key holes right above them and the center of the medallion on the top? That would spread out the “goodness” and draw the eye around more! You are a real inspiration and much more daring than I am…you show me that great results can happen when we escape our comfort zones!!!! Thanks so much Tania! Polka dots to the rescue. I love doing makeovers that only cost a couple of dollars. Just subscribed! 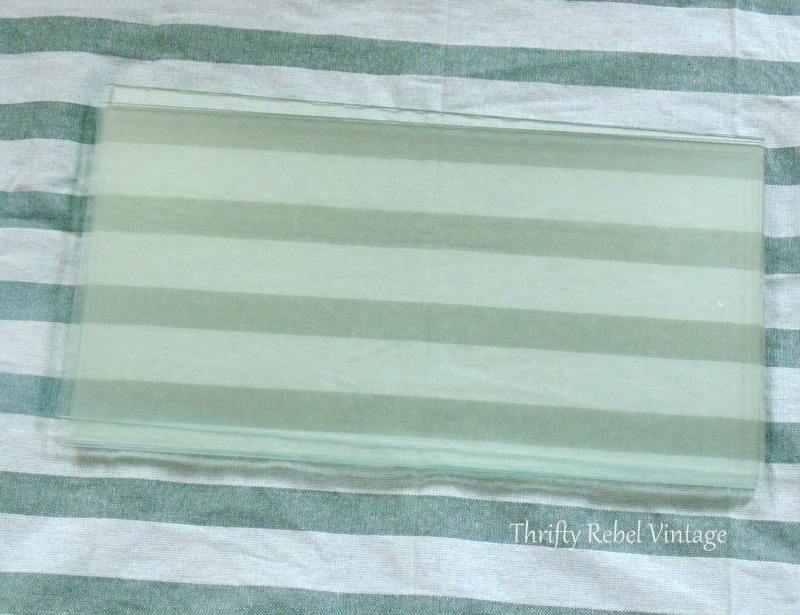 Your china cabinet redo was inspirational to me. 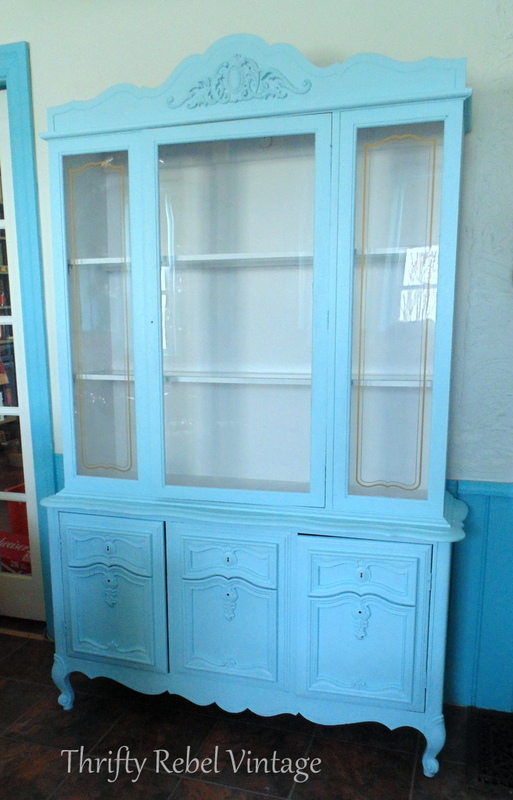 I have a china cabinet, that my mother has given me,and it looks a bit like yours, as far as structure. 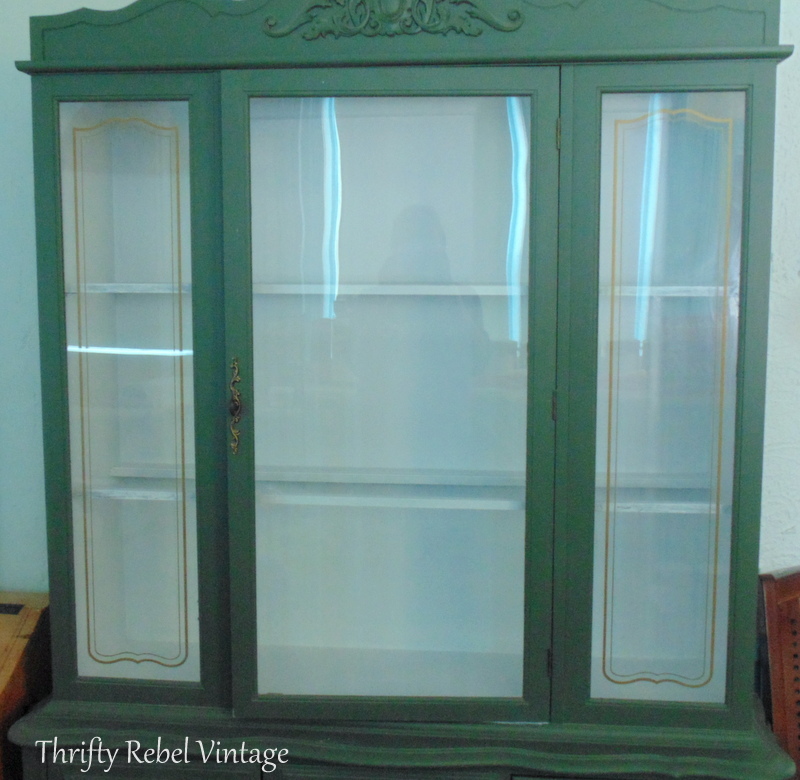 Yours is the first time I’ve seen a china cabinet redo that actually makes me feel like I want to take the plunge and make the change to mine, as well. You might have already addressed this but when you are painting….are you using a chalk paint,a semi-gloss paint or what kind of paint? If you don’t mind answering that, as well as, did you put a sealer on it at all? And again, thank you for the inspiration and the courage you have given me through your beautiful post!!! Thanks Kirby! That kitchen sounds right up my alley. I’ll be adding a few hits of yellow accents just for fun. Colour schemes always work better in threes for me. I do love the look of McCoy pottery, but have never seen a piece in a thrift store around here. You have really outdone yourself Tuula. Looks fantastic. 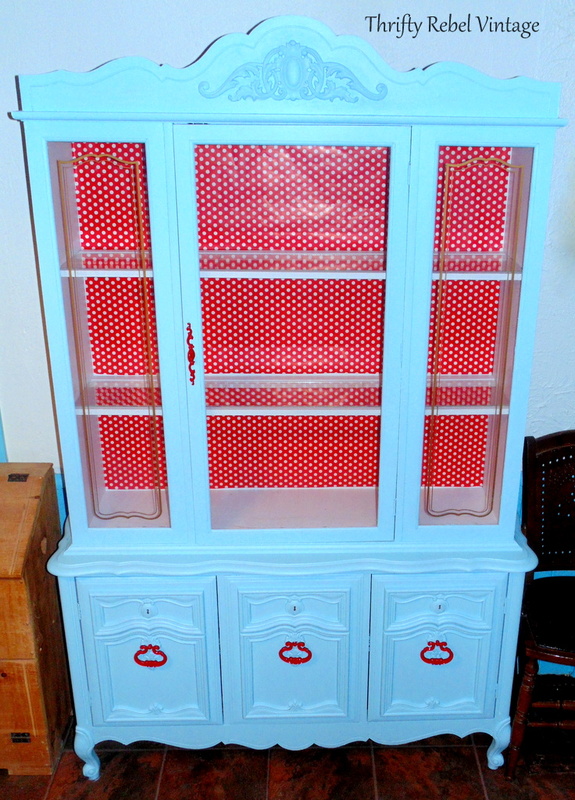 Love the red and white polka dots. Makes everything really come alive! Cheers. So charming! Can’t wait to see what it will look like filled! Thanks Jill! Me too. lol. It might take a while, but I’m going to enjoy the treasure hunt. Tuula, Trust your gut is a good motto! The cabinet turned out great! Love the colors. Thanks for sharing. 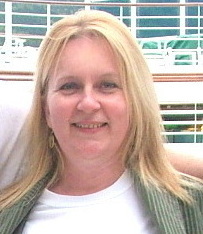 Sylvia D.
So fun! My favorite color combo. And I always love polka dots! Thanks for sharing with SYC. Tuula I’m so glad you trusted your gut and were not afraid of a little extra work. The aqua looks soooo much better than the red. It looks fresh and bright and super retro! Love your vision and can’t wait to see the whole kitchen. Thanks Sandi! I’m so looking forward to garage sale season in May. I think that’s when I’ll have my best chance at finding some treasures for my cabinet. I’m going to enjoy the hunt. Such a cute makeover! It looks Cath Kiddson-ish!! 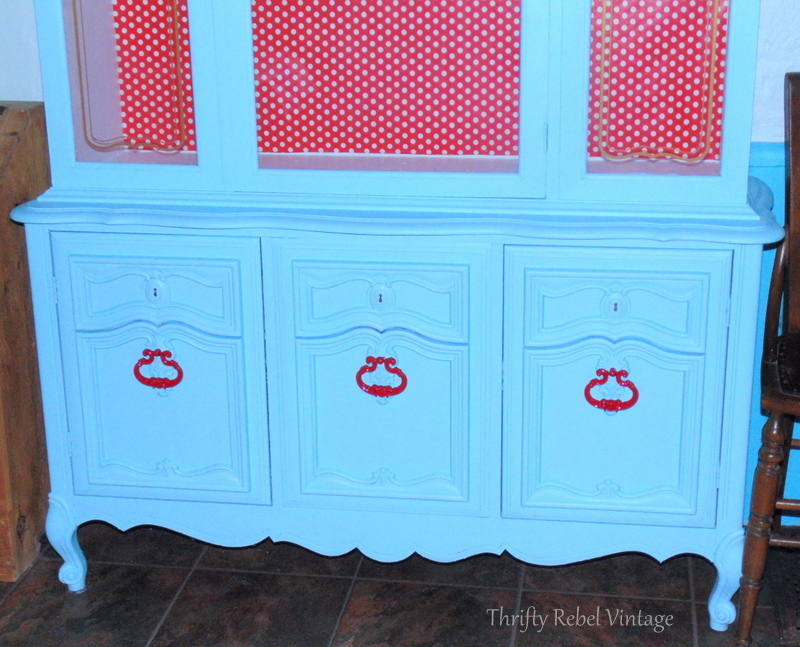 I have Old Country Roses China as well…also painted my china cabinet… But a lighter blue…. Think I’m going to find some red paper/fabric for the inside now! Thanks Mary Lea! Go for it. 🙂 The aqua and red has become a favourite combo of mine. They look so great together.